Like many of you, we’ll be doing some traveling with the kids this summer. Planes, trains, automobiles–we’ll be doing it all. I’m glad we won’t be toting any bulky baby gear, but big kids in booster seats don’t have those nice headrests to prop their heads up during a nap on the go. 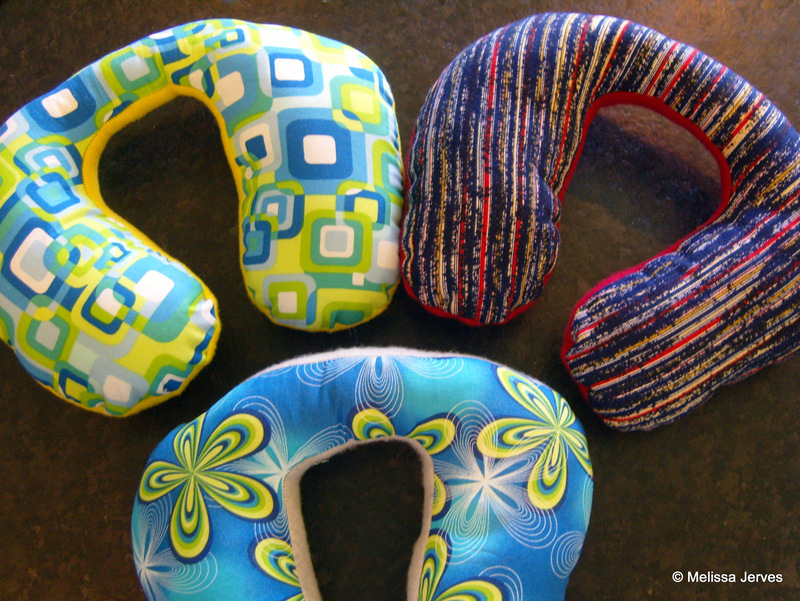 But nothing passes the time better on a long travel day than a nap, so I made the kids some travel pillows. I almost bought them something like this or this, but didn’t really feel like spending almost $50, since I need one for each child. This was a project that fit my mediocre sewing skills and short attention span, and it cost me nothing. I used fabric and polar fleece remnants from other projects. As usual, I searched for an online tutorial, and found several to choose from (here’s one and here’s another). I traced out a pattern on newspaper, cut out all the pieces of fabric, stitched, turned and stuffed. I invested at most an hour for all three pillows. I’ve got other things to spend $50 on, thank you very much. Are they perfect? No. Perfectly functional? Absolutely. The kids are excited to have their own special pillows, and maybe…just maybe…they will take a little nap. What a great idea! My daughter isn’t quite at the age where she can use these, but I have a few nieces/nephews who would probably love it! How cool is that! My daughter would love it!